Thank you for your review. As you mentioned, K-7 record volume is relatively low, which I found lower than K-x. Any thoughts? @Tony, well, I use the RØDE Stereo VideoMic and even with the -10dB Switch I now had one recording (a live music performance) which clipped! The RØDE Stereo VideoMic has a sensitivity of 12.6 mV @ 94 dB SPL +/- 2 dB @ 1kHz without the -10dB, i.e., with 12.6 mV @ 84 dB SPL I already experienced clipping once. Therefore, I am really glad that the recording level is exactly as low as it is. A manually adjustable gain would be better even. All other alternatives (higher gain or automatic gain control) would be MUCH worse, though. I never experienced any problems in adjusting the level of noise during post processing. Most post processors / converters offer an automatic normalization of audio level which I recommend to use. The K-7 audio input has a very low noise floor. I never had an issue with noise after audio level normalization. I was talking about the built-in mics. So in your opinion, low volume is better than high? I do notice that K-x records more treble and K-7 more bass if their volume is normalized to each other. But the original signal/noise ratio is higher in K-x. The video samples in dpreview seems to confirm my observations but they are not side-by-side comparisons. Would you mind to do an audio test or just simply make your original videos of camels available with sound recorded by built-in mics? Playing around with the video today I noticed that it allows exposure compensation. It does this without changing the aperture. There are only two ways I know of while keeping the aperture the same this can be done, changing the shutter speed or changing the ISO. It limits the range to +/-2Ev which is a pity. Have you done any analysis of what it changes to do this as it may be an easy way give some control one of the parameters at least? Never mind. I just read your back door description. D'oh. Hey Falk! Thank you for this review. I have my K7 since they released it and I'd love to make some video shorts with it, but I'm very jealous of those Canon users that have manual controls on their DSLRs. I read that 1/60 is the best for 30fps but how can I stablish that and mantain it as much as possible while recording? I'd also love to have my ISO under 1600 because i'ts too noisy for a decent movie and don't want postprocessing because i'd have a leak of quality and sharpness. you can watch the exposure settings in LV (still mode) and when switching to video, point at a direction were you have known (EV) settings. Then you can use +/-EV compensation and AE-Lock to select the required recording EV and lock it. Note that shutter and sensitivity are always provided by the camera based on aperture and EV situation (which is why I created the table above). But you can control aperture and the EV value the camera thinks it must shoot at. 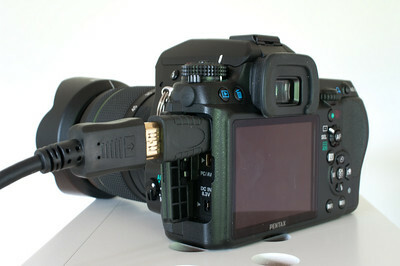 There is a thread in the video subforum at pentaxforums.com explaining how you can actually lock a KNOWN EV situation in LV mode (so you can see all recording parameters) and carry it over to video using a manual lens and USER mode. But note that while this works, the camera will still shift shutter and ISO to obtain a combination as listed in my table above. Thanks for your good advises! One question: it looks like the aperture cannot be controlled using the ring on a -M lens. Does it automatically default to the biggest aperture? It is true, with an M-lens the aperture stays wide open during live view, i.e., while the camera isn't actually recording. But that doesn't matter much. You are right: an M-lens closes the aperture nicely during recording. Since auto focus is barely an option the superior M-focussing is fantastic. Once again a reason to enjoy the old glass! I'll certainly experiment with your tip to use AE-L and manual aperture to switch between differently lighted zones... with the 50-500 Bigma using it's aperture ring! does all this work also with K-5? > does all this work also with K-5?